Paper Crafts by Candace: Pink by Design - Giveaway!! Pink by Design - Giveaway!! I am soooo excited for May's Pink by Design stamp release! I will get some of the new stamps in the next couple of days and will start sharing sneek peeks with you all! In the meantime, how would you like to win a Pink by Design stamp set? I am giving away the stamp set "Grow". This is a STAMP OF THE MONTH stamp set, whoo hoo!! Here is what the stamp set looks like.. 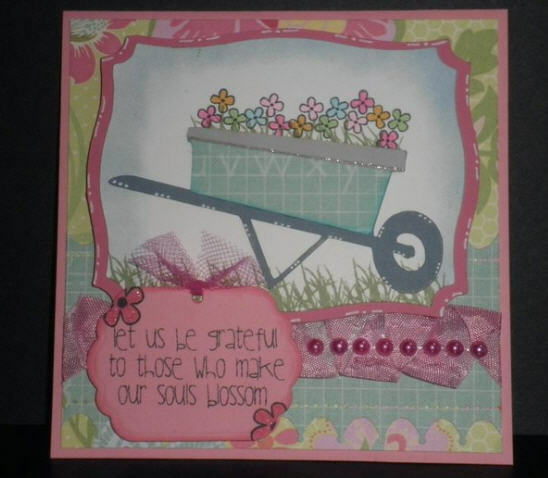 Here is a card that I made using this set..
Ok so now to win this set all you have to do is visit Pink by Design, look at the stamps and then come back here and tell me what your favorite stamp set is, it's as easy as that! I will announce the winner next Wednesday!! Next Thursday is the Pink by Design Ustream for the May Stamp Release. If you are on facebook you can see details for the event here.. Birthday Week Celebration, Pink Party and Pink by Design Stamp Release. If you aren't on facebook you will be able to get to the Ustream channel here. I LOVE the All Girl set!!! Gorgeous card you made using this flower set!! This is a close second for me - I love flowers and the placement in the wheel barrel is extremely beautiful! Thanks for the chance to win! hi candace, your card is very pretty thanks for sharing, stopped by pink by design , i really like the aloha set!!! I really like the Fly Away With Me January 2011 set. Your work is Amazing! I wish you could teach me! love this card. I really like the zebra one. for setitments I love the dad set. Candace, I love all of Sarah's stamps! You made such an awesome card with these stamps!! I just love it. So pretty:) I would have to say my fav stamp set is the Sympathy set. There are so many perfect sayings and I really make a lot of Sympathy cards. They work nicely! Thanks so much!! I LOVE so many of them- if I had to pick a favorite, it'd be between All Girl and Animated Greeting - so cool. Love the card you created to! VERY cute! Love your card and the stamp set you are giving away! I jumped over to Pink by Design and I LOVE the Distressed Music! I have actually never looked at her stamps and now I REALLY WANT THAT ONE!!! lol. My daughter is a huge choir "nerd" is what she says. Such a pretty card and beautiful sentiment! My favorite of Sarah's stamps is the Animated Greetins set! I love the Baby Love Set. So many co-workers are having babies now. Thanks for the chance. I wood love to get "woodland critters". Thanks for a chance to win. I love the card. I have a few of Sarah's stamp sets. The baby set is great since we have 3 babies arriving this year. I used them to make baby favors. The set that is at the top of my list right now is the Canada set. I'm Canadian and you don't see set like that often! Love it! my favorite right now is the Baby Love... many wonderful women in my life right now are expecting and it's perfect for cards and layouts! They are all gorgeous but my favourite is small banners! Perfect for the cards i like making! 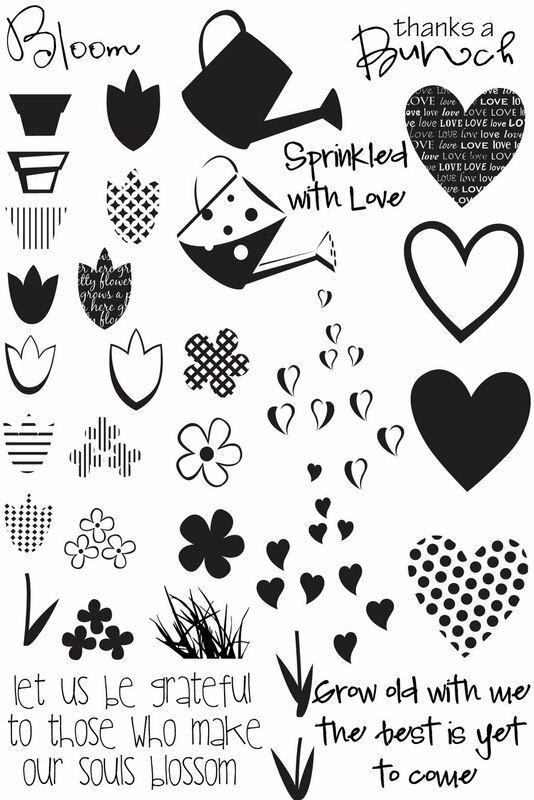 I LOVE all of Sarah's stamps, but I think the Sympathy set is one of my favorites. Beautiful card! TFS! I love the jungle fever set :) Thanks for the chance to win! Hi, Candace...My favorite set is Designer Boots! Thank you for the chance to win. Love the card! Animated Greetings is my favorite. I really like the Shop-A-holic set. Love your card! So pretty! Um, pick a favorite? I love them all! ONE of my favorites is Shop a holic! Thanks for the chance to win! how can you pick a favorite???? if I must, i choose Shop a holic!! Thanks for the chance to win!!! Oh my gosh Candace, it's hard to pick a favorite! I think I would pick "Animated Greetings" 'cause it has a lot of fun sentiments! Your card is so sweet! Love the wheelbarrow of flowers and your color combo! Cute card and stamp set. My fave is the Distressed Music stamp! Love it!! Thanks for the chance to win and good luck to everyone else. My favorite is the Hey Cupcake stamp of the month now. These are really cute stamps. I went to her website and I just LOVE the Designer Boots stamp set from February. Too, too, cute! Love your card. It is had to pick just one. I guess the dad set would be my fav. I really like those sentiments. Thanks for the chance to win! My favorite is Our Kids!! I have 3 little ones and it would be perfect for them!! Love your card. I love the Pink By Design sets, although I have yet to be able to purchase any. I really like A Pirate's Life stamp set. Currently have my eye on hats off... With Graduations coming up, I'm excited to work with these for cards and other projects. Hard to choose just one but I think A Little Bit of everything. The card is awesome really like the new stamp set. Favorite?!?! OMG that is just too hard with soooo many to choose from!!!! I really loved the Christmas ones! Wonderful card...you are always an inspiration...keep it up! I love the Aloha Stamp Set. The Grow set is adorable. Picking one is TOUGH! I like them ALL. But if I had to have some right now! It would be DESIGNER BOOTS, ALL GIRL and A CUPCAKE FOR YOU! Beautiful car! I love the 'All Girl' and 'A Cupcake for you' sets the most - they are all wonderful! My favorite would have to be "A Haunting We Will Go." The sayings are so cute. Great card work as usual, thanks for sharing. Absolutely adorable !!! I love all the options you have with this set. and your card is of course toooo cute! I love your card. So pretty! Love the stamps you are giving away. The card you made is so cute. My Partner in Crime, Michelle! Perk Up- Pink by Design SNEAK PEEK!! Happy Pink by Design Friday!! Hot Pink and Zebra Striped birthday!